In Alerts, I'm getting this error message (in comments), I am not sure how to fix it. Help? 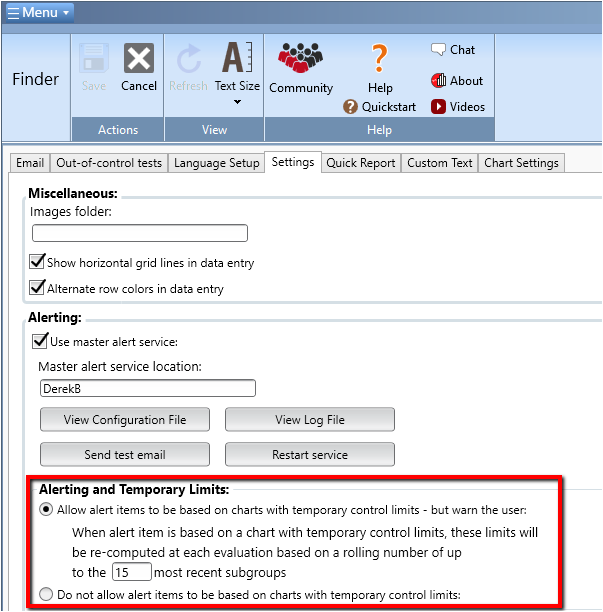 "Alerting only on out of control with configuration that does not allow temporary limits and the chart uses temporary limits for alert TestWeek." I am not sure how to fix this issue, I have tried making new data group and adding it to the alert, nothing worked. All charts in SQCpack begin with what we call Temporary limits. When temporary control limits are used on a control chart, the temporary limits are computed using all the subgroups covered by the chart. For instance, if the chart is set up to display the Last 35 subgroups, then the temporary control limits are calculated using the Last 35 subgroups shown on the chart. If the chart is set up to use the last month of data, and that results in 325 subgroups of data, then the temporary control limits are calculated over those 325 subgroups. The control limits used for SPC analysis, i.e., out-of-control analysis, are important because they represent the process at a time in the past when the process was in-control. The SPC analysis shown on a control chart, or performed by the Alerting system, is constantly asking the question, "Does the current data point indicate a significant statistical difference when compared to the process that existed when the control limits were calculated?" If the answer is yes, it represents a signal that one can investigate in order to understand what the process is currently doing and perhaps take action to correct an unwanted process change. Since a control chart is comparing each data point to the process parameters as they existed when the control limits were calculated, the validity and/or usefulness of the control chart depends to a large extent on whether an appropriate set of control limits is used in the analysis. SPC makes the assumption that a person who understands the process choses a point in time when the process was stable and in-control to calculate the control limits that are being used for analysis. This is why temporary control limits are not recommended, because a knowledgeable person has not picked a point in the past when the process was in-control to calculate the control limits. Instead, with temporary limits, the control limits are calculated over the data currently displayed on the chart, and thus are likely to be inappropriate to use in evaluating whether a process change has occurred. We strongly recommend not allowing SQCpack to alert on control charts with moving/temporary limits. Instead, best practice would be to consciously compute limits as a guideline for future Out-Of-Control Testing. HOWEVER, we understand that every process is different and that there may be circumstances where temporary limits work well for SPC analysis. Choosing between the radio options above will configure the alerting service to work in a way that you prefer.